From Bill Bryson’s Book: “A Short History of Nearly Everything”. Also know as the K-T Band, this sample contains an iridium anomaly which characterizes it as asteroid-laden dust described succinctly by Jim Broda as the “Dinosaur-killing cloud of extra-terrestrial dust from the K-T Band”. Sediment from the first core taken that displayed a clear chemical signature … not big, but a tiny spike at the depth in the core of about 65 million years ago, called the Cretacious Tertiary Boundary. The sediment is from 30.44°19.9’ north, 157°49.4’ west, 3100 to 3115 meters deep. It’s from ship LongLines, cruise 44, October 1976, Leg #1. 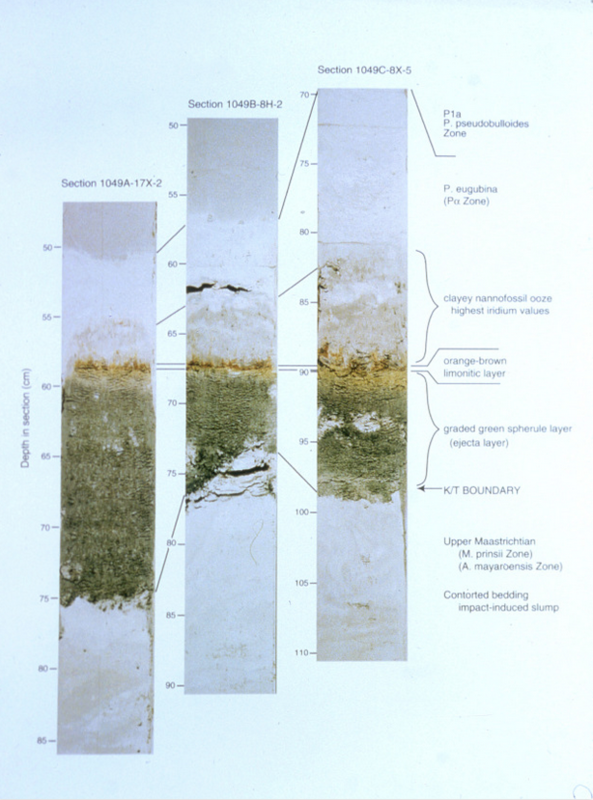 The split core samples in the image below show the dark area called “the injecta layer” and K/T Boundary. Thanks to Brian Huber at the Smithsonian’s Museum of Natural History, for giving me permission to use this slide. I have this material because I made a gift to memorialize Charles David Hollister, which I gave to the Woods Hole Oceanographic Institution. A small amount of the sediment remains. For more information, search with keywords found in text here as well as the name Luis Walter Alvarez, a physicist awarded with a Nobel Prize in 1968.